June 29, 2012 July 10, 2018 adminLeave a Comment on O-hitashi, Japanese Style Spinach- Blanching Spinach with Sesame and Soy Sauce. If you use the spinach with the stem, separate the stems and the leaves while washing them. Blanching baby spinach in boiling water a few second just when the leaves looks wild and turn darker green. For regular spinach, put the stems into boiling water for 15 second, then add the leaves, cook for 20 seconds. Toast sesame seed over medium high heat until it start to pop and pale tan color. Remove from heat continue to stir a few more minutes. Set aside to cool. Drain spinach and squeeze excess liquid out again. Line up the spinach on the cutting board and form a log shape 4 cm (1 1/2-in) in diameter. Squeeze again to make it firm, cut across into 4 cylinders. You may use a round thick cookie cutter as a mold and stuff spinach in it. 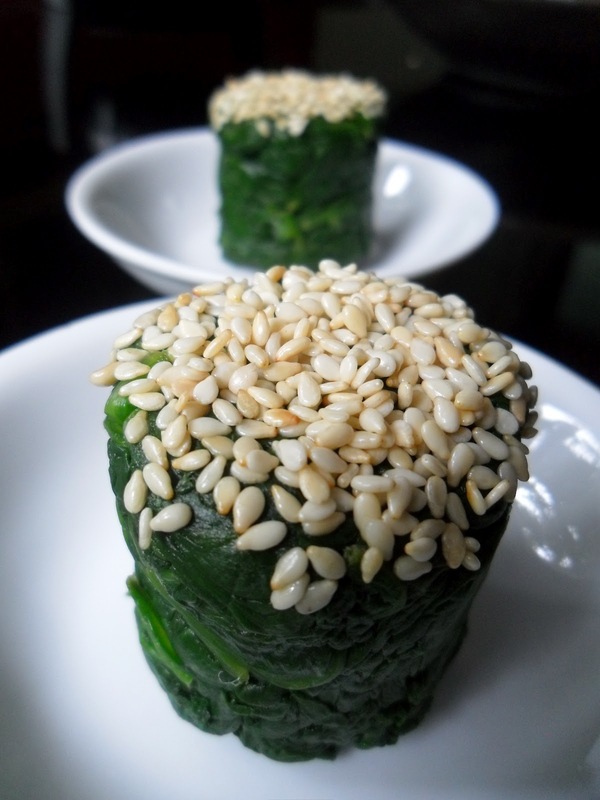 Sprinkle with sesame, serve in individual plates or in 1 large plate.